Where is the Ranch of Lonesome Dove located in DFW metroplex? Do we have alcoholic beverage options with our events, weddings, wedding receptions, picnics, reunions, meetings, team building or parties at the Ranch of Lonesome Dove? Can we bring our pets to events, weddings, wedding receptions, picnics, reunions, meetings, team building or parties the ranch of Lonesome Dove facilites? Do you require a deposit for events, weddings, wedding receptions, picnics, reunions, meetings, team building or parties at the ranch of Lonesome Dove? Can we make payments during the year before the event, wedding, wedding reception, picnic, reunion, meeting, team building or party at the Ranch of Lonesome Dove? Do you provide a contract for the events, weddings, wedding receptions, picnics, reunions, meetings, team building or parties at the Ranch of Lonesome Dove? Can you describe the ranch wedding reception, picnic, meeting, and party facilities? Do you have recreational areas available during our event, wedding, wedding reception, picnic, reunion, meeting, team building or party at the Ranch of Lonesome Dove? Can you go horseback riding during our event, wedding, wedding reception, picnic, reunion, meeting, team building or party at the of Lonesome Dove? Do you have pony rides for the children during our event, wedding, wedding reception, picnic, reunion, meeting, team building or party at the of Lonesome Dove? Do you have Hay Wagon rides during our event, wedding, wedding reception, picnic, reunion, meeting, team building or party at the Ranch of Lonesome Dove? Do you have entertainment for children during our event, wedding, wedding reception, picnic, reunion, meeting, team building or party at the Ranch of Lonesome Dove? What kind of events can be booked at the Ranch of Lonesome Dove? Will other events, weddings, wedding receptions, picnics, reunions, meetings, team building or parties be booked at the same time as my event at the Ranch of Lonesome Dove? What are your business hours at the Ranch of Lonesome Dove? How do you charge for events, weddings, wedding receptions, picnics, reunions, meetings, team building or parties at the Ranch of Lonesome Dove? Do you have outside drink stations available during our event, wedding, wedding reception, picnic, reunion, meeting, team building or party at the Ranch of Lonesome Dove? The ranch is on 63 acres, which is located about 15 minutes west of the DFW International Airport overlooking Grapevine lake, in Southlake, Tx. For directions and a map, please click here. Yes, we have three option available. Bring your own bottle (BYOB), full cash bar, or have none at all. Please see our packages for more spcifics related to this option. We are sorry, but pets of any kind are not allowed at your event, wedding, wedding reception, picnic, reunion, meeting, team building or party at the Ranch of Lonesome Dove. Yes, we require a 20% deposit to reserve a date at the signing of the contract. The final payment is due 7 days prior to your event, wedding, wedding reception, picnic, reunion, meeting, team building or party at the Ranch of Lonesome Dove. Yes, we will be glad to allow you to make payments before the party on a lay-away type plan. There is no interest rates or charges for this option. Yes, we require a signed contract for your protection. The signed contract will reserve the facilities for the date fo your event, wedding, wedding reception, picnic, reunion, meeting, team building or party at the Ranch of Lonesome Dove. The ranch of Lonesome Dove is located on 63 acres overlooking Lake Grapevine. The facilities are Texas ranch rustic and surrounded by towering live oak trees. The lawns are manicured with a stunning view of the lake. There is ample parking for all. The main facility is a 14,400 square foot air conditioned building with complete and modern facilities for your convenience. The building includes a large entertainment stage with public address system for 700 guests, wooden deck, large dance floor, beverage bar with separate soft drink area. Just outside the building is a 2000 square foot patio over looking the lake. Our wedding ceremony facilities also include a beautiful white wooden gazebo located on a manicured lawn along side a small pond with a stunning view of the lake. Our quaint wedding chapel is a beautiful old historic Texas church painted white. The church has an incredible view of the lake and woods. The Lonesome Dove chapel can seat 100 guests at one time. We promise a wedding and reception that will be remembered by all! Yes! We have soccer, baseball, and football fields (remember to bring your own equipment). We also have 2 sand and 2 grass volley ball fields, 4 horse shoe pits, badmiton, croquet, and two private fishing ponds (remember to bring your own pole and bait). Can we go horseback riding during our event, wedding, wedding reception, picnic, reunion, meeting, team building or party at the of Lonesome Dove? YES! We can provide trail rides for the adults. Our horses are gentle and forgiving.An expert handler will be available at all times to assit you in learning the ropes. Now this is an option that is well worth your ranch experience! YES! We can provide hand lead pony rides for the children. Our ponies are gentle and forgiving. The kids will never forget this option! YES! We can provide a tractor pulled hay ride for all events. The ride lasts for about 20 minutes. 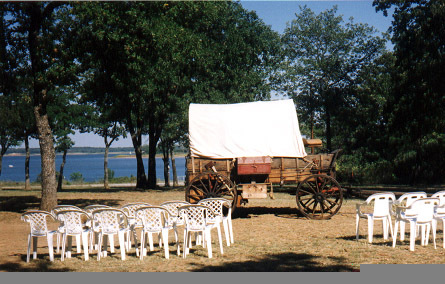 Your guests will go through fields, woods and by lake Grapevine. It's a great ride, with really great stories being spun by the wagon master! You will be amazed at the facilities and services we have to cater to children! We have trackless train rides, hay wagon rides, sack races, water balloon toss, face painting, pony rides, petting zoo, balloon sculptures, bounce house, soccer, baseball and football fields, volley ball, horse shoe pits, badmiton, croquet, 2 private fishing ponds,as well as, a complete play ground. If can be gotten, we will get it! The Ranch of Lonesome Dove can handle groups sizes of 50 to 2500. We have full complete sound systems, Public Announcement systems, wedding chapel, gazebo, a 14, 400 square foot air conditioned building with stage, complete entertainment system, located on 63 acres. So there isn't much that we can't handle! We have standard packages for weddings, chapel weddings, wedding receptions, company picnics, Business meetings, family reunions, class reunions, team building activities, and holiday parties. Please click here to see our services page to learn more about our packages. Just because we don't have a package, doesn't mean we cant do it, so give us a call at metro (817)329-1100 and see what we can do for you today! Click here for other contact information. NO! You will have Exclusive and private use of provided facilities during your entire event, wedding, wedding reception, picnic, reunion, meeting, team building or party at the Ranch of Lonesome Dove. We never double book an event, wedding, wedding reception, picnic, reunion, meeting, team building or party at the Ranch of Lonesome Dove! If I need to call, what are your business hours at the Ranch of Lonesome Dove? The Ranch of Lonesome Dove Business office is open from 8:30 a.m. until 5:30 p.m. Monday through Saturday. Other times are available by special request and appointment. Call us at metro (817)329-1100 to schedule a meeting today! Click here for other contact information. You will be charged according to the day of the week, the package you select and any options you may select. Please click here to see our services page. We charge on a per person basis, each package has a minimum number of guestsrequired. All packages wil contain the basics of facility rental, catering, entertainment, and beverages. Our packages are very flexible and can be designed to meet any of your special requirements. Yes! We have Softdrink and water drinks stations available for outside events, weddings, wedding receptions, picnics, reunions, meetings, team building or parties.